Back of the Cereal Box: Long May You… Loof? While I have still not yet been able to determine whether Super Mario Bros.’s “field horsehair plants are actually a thing, a stray memory form deep in my brain burst forth today and I decided to look into whether there exists such thing as a priphea flower. These plants appear once or twice as a minor plot point in a lesser-known Super Nintendo-era video game called, miserably, Lufia and the Fortress of Doom. I know — what? In Japan, it was released under the far better title Estopolis. For whatever reason, some translator decided to name the game after its heroine, which is all well and good for this game along but which becomes somewhat problematic when it spawned a sequel that did not feature the character Lufia in any way but which was nonetheless known to Americans as Lufia 2: Rise of the Sinistrals. Again — what? 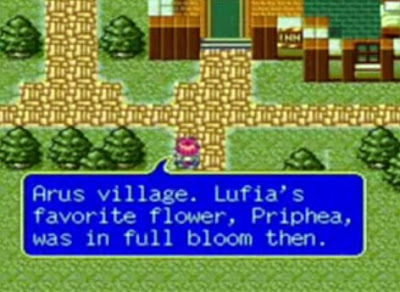 In any case, the priphea flowers — which actually might show up in Lufia 2 as well — aren’t real. Google turns up virtually nothing that doesn’t seem Lufia-related. Thus, it seems safe to say that the priphea is fictional. And since I’m on the subject, what the hell kind of name is “Lufia” anyway? The fact that I knew a girl with that name aside, it all seems rather unfortunate.